Richard's family fun ventriloquist show is a hilarious performance for all ages. He mixes kid friendly clean comedy, outrageous colorful life size puppets, music, magic and lots of funny audience participation. Here is a short description of Richard Paul's ventriloquist family show as written by one of his clients Darleen Higgins, RN Research Coordinator for Cardiovascular Research & Education Foundation, Inc. (CaRE Foundation, Northern Wisconsin). "Ventriloquist Richard Paul was brought in to entertain us after dinner on the opening night of our weekend seminar for area physicians, medical professionals and their families. Of course, we expect to see the usual ventriloquist act, a guy throwing his voice with a wooden puppet. And Mr. Paul did a fine job with his wooden puppet TJ but he did a lot more than that. He performed ventriloquism with everything from his hands to everyday household object, and brought up audience members for hilarious gags! 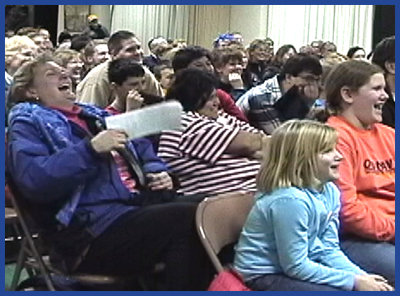 Over 200 were in attendance that night, and everyone was engaged for close to an hour with his wit, creativity, and talent in ventriloquism. The CaRE Foundation was very pleased with the job Richard Paul did for us. If you are looking for quality, family-friendly entertainment, Ventriloquist Richard Paul is your man!" "Great to have you! Those kids are still hooting over the Shawn and Julie show as Micky and Goofy! I love how right off you told them about your arm, and after that it was just not an issue at all, pretty amazing." "Your jokes and banter with the audience through your ventriloquist characters was excellent." "Thank you, too, for coming back to Trinity. We really enjoyed your entertaining assembly during our Lutheran School's Week. I will certainly get the word out to other schools in the area." "I can't thank you enough for the opportunity to come to Crossroads this weekend and to see your show. The kids cannot stop talking about how much fun they had and HOW FUNNY the show was!! We routinely discuss our day at bedtime and our weekend as a whole on Sunday night. Overwhelmingly, the response to "what was your favorite part of the day/weekend?" was ... THE PUPPET SHOW!!!!!! " For more than two decades Richard has astounded his audience with his high quality, outrageously funny, creative clean family comedy show, awesome puppetry and his extraordinary ventriloquist skills. Often audience members and clients have commented on how they actually thought the puppet were real and forgot that Richard was the one making them talk.